The first systematic study to demonstrate that early building blocks of life may be produced when low-energy (< 20 eV) electrons interact with cosmic (interstellar, planetary, and cometary) ices,” will be presented by Chris Arumainayagam of Wellseley College as part of the annual press briefings kicking off the American Astronomical Society (AAS) national conference in San Diego, Calif. The goal of the research is to understand the “chemistry of the heavens” by recreating what happens in interstellar space when high-energy cosmic rays (some with energies much higher than could be produced by the Large Hadron Collider) impact ices (containing water, methanol, and ammonia) surrounding micron-size dust grains in dark dense molecular clouds, where the pressure is ten trillion times lower than that of atmospheric pressure. Arumainayagam, a professor of chemistry, suggests that low-energy, electron-induced condensed phase reactions may contribute to the interstellar synthesis of prebiotic molecules previously thought to form exclusively via UV photons. In the simplest possible terms, his work is consistent with the idea that we really do come from stardust and is relevant to the first unambiguous detection of glycine in a comet, reported in May 2016. The interaction of high-energy cosmic rays with matter produces copious numbers of low-energy electrons. Arumainayagam’s results demonstrate that low-energy electron and UV irradiation of methanol ices yield essentially the same reaction products. However, his studies to date have also identified one possible electron-induced cosmic ice chemistry tracer, methoxymethanol, a “complex” organic molecule not identified in UV laboratory photolysis studies of condensed methanol. Future astronomical identification of methoxymethanol within interstellar and/or circumstellar clouds could provide additional evidence for the role of low-energy electrons in astrochemistry. His findings illustrate an urgent need for astrochemical models to include the details of low-energy electron-induced reactions in addition to those driven by UV photons. Jyoti Campbell, a Wellesley College sophomore, will give an oral presentation at the conference entitled “The Role of Low-Energy Electrons in Astrochemistry: A Tale of Two Molecules.” Campbell has had access to a caliber of technology and equipment rarely available to undergraduates. To attend the conference, she will be taking a break from her summer work at the Jet Propulsion Lab (NASA). 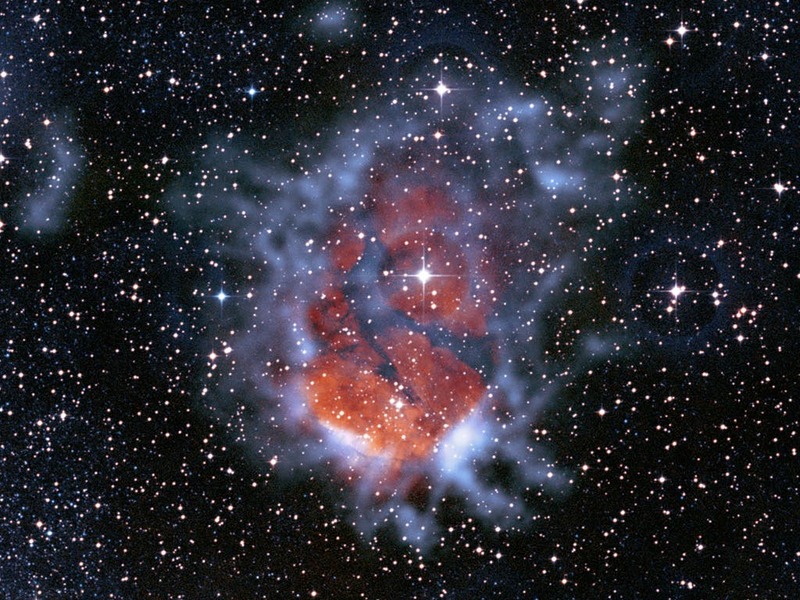 The image at the top of the page shows RCW 120 (also known as Sh 2-3 and Gum 58), an H II emission nebula in the southern Milky Way. The expanding star-forming cloud of ionised gas, about ten light-years across, is located some 4,300 light-years away in the constellation Scorpius.